Finding good pirate books can be a bit of a challenge. We found some great ones in our Best Books for Boys: Pirate Books post which we called A Treasure Chest of Pirate Books–yes, they are that good! However, many of those were geared toward older boys. This list is for your young buccaneers. Good, fun pirate books! From ABCs, to time on a pirate ship, to a book with a bit of music, all of these books deliver. We love pirates and are really enjoying going back through all the books we used to read together and finding new titles to add to our best books for boys pirates lists. I am especially fond of the first book here, Edward and the Pirates. It is really wonderful and if you read only one pirate book to your son (but why stop there!) I would suggest you make this your top choice. I think young pirate fans will enjoy reading more about pirates and hopefully finding some books they will love. So let’s get to it matey, it’s pirate book time! 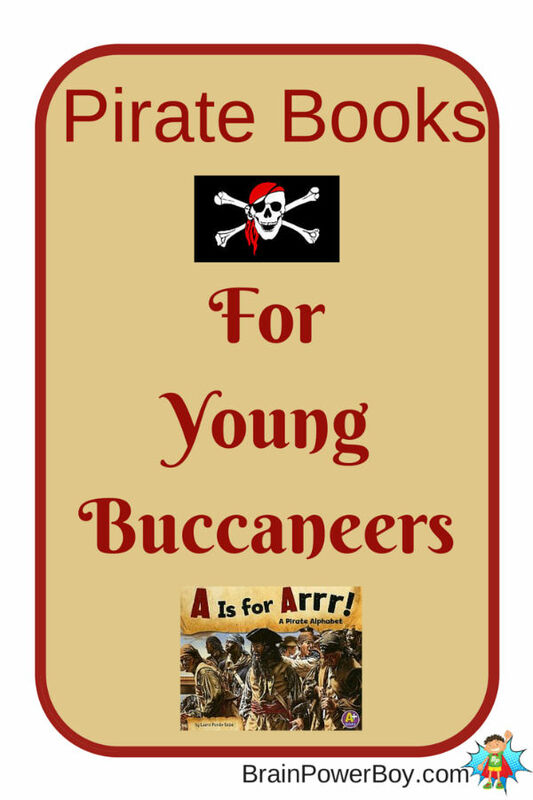 Pirate Books for Young Buccaneers! Edward and the Pirates by David McPhail. I love this book and read it so many times to my son who also loved it when he was big into pirates. The family is just great and I really always enjoyed that Edward was big into reading. There are books and adventure and a white horse and sword-waving pirates. What more could one ask for! Highly Recommended. Shiver Me Letters: A Pirate ABC by June Sobel, illustrated by Henry Cole. A romping tale for the preschool set this book is colorful and amusing. All about a search for letters, which we all know are true treasures. Port Side Pirates by Oscar Seaworthy, illustrated by Debbie Harter. This book is a song and includes a CD in the back. There is an illustration of the pirate ship with parts listed, facts about pirate ships, pirates around the world and famous pirates, as well as the music to the song. Pirate Attack! by Deborah Lock is a DK Reader, level 1. Travel with Jim the cabin boy as he tells his tale of ime on the Queen Anne’s Revenge. While this book is for younger kids, they do mention a “fight to the death.” That’s pirates fer ya. A Is for Arrr! : A Pirate Alphabet by Laura Purdie Salas. B is for booty, E is for eye patch. I like this book. The illustrations and pictures are very nice and there is enough info to keep young pirate lovers interested. This book includes a Fun Facts about Pirates section and a Glossary. It is really nicely done and worth seeking out. How I Became a Pirate by Melinda Long is certainly a popular pirate book. Imagine building a sand castle and suddenly being asked to go along on a pirate adventure. Boys will enjoy the fun humor and the very idea that someday, maybe- just maybe, they could have a fun thing like that happen to them! A Year on a Pirate Ship by Elizabeth Havercroft. This is a unique book which follows a pirate ship through all the months of the year (neat idea!) You have a view below deck with spots of the ship’s hull taken away so you can have a peek inside. It also has a seek and find included on each 2 page spread. Overall, this is an entertaining and enjoyable read. I hope you have enjoyed this list of pirate books for boys who are aspiring young buccaneers. Please take a moment to pop over and see our new best books for boys list. There are a lot of great books to discover. Your boy is sure to love them. Thanks so much for stopping by. What is your boy’s favorite pirate book? Leave a comment–I would love to get to know you better.